An image of the stretched-out Messier 66 galaxy, as seen through three filters on the Hubble Space Telescope. Hubble has snapped an amazing new photo of a peculiar galaxycaught in the middle of two other galaxies that appear to be stretching it out. The oddball spiral galaxy, called Messier 66, is one-thirdof the Leo Triplet, a group of three interacting galaxies about 35 millionlight-years from Earth (a light-year is the distance light can cover in ayear). Messier 66 is larger than its fellows, but it appears that they arehaving a strong effect on the central galaxy. The spiral arms on Messier 66 look out-of-whack. Most spiralgalaxies have symmetrical arms where thickets of gas, dust and newly born starstwist around the galaxy's center. But in Messier 66 the arms are asymmetricaland climb above the galaxy's main disc. Even the dense cluster of material atthe center, called the nucleus, appears to be displaced. Researchers think these effects were caused by thegravitational tugging of the galaxy's neighbors, Messier65 and NGC 3628, which have distorted Messier 66 over time. 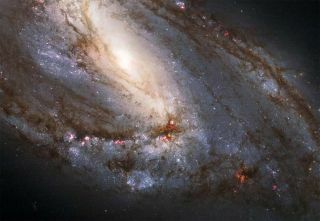 The new photo was taken by the HubbleSpace Telescope's Advanced Camera for Surveys. It reveals fine detail alongthe galaxy's spiral arms, including clusters of bright stars that are visiblein the picture's blue and pink regions. These clusters can tell astronomers alot about how the galaxy evolved over time. The nearly 20-year old Hubbleobservatory has been snapping iconic photos of the universe since it waslaunched in April 1990. Over the years it has been visited by astronautsmultiple times for repairs and upgrades, including during a recent spaceshuttle mission in May 2009. That trip left the telescope in good shape to keeprunning for at least five more years.